Plot – Thug for hire Jackson Healey (Crowe) and bumbling ex-cop turned private eye Holland March (Gosling) find themselves partnering up and on a high profile case involving murder, deception and government officials in the smog filled landscape of Los Angeles in the 1970’s. After gifting us the original team up of Riggs and Murtaugh in 1987’s Lethal Weapon (as screenwriter) and combining the services of Robert Downey Jr. and Val Kilmer in the fantastic 2005 cult hit Kiss Kiss Bang Bang (as writer and director), Iron Man 3 director Shane Black has now added the successful team up of one time pin up boy Ryan Gosling and the increasingly gruff Russell Crowe to his resume in the fun, colourful and Coen Brothers like The Nice Guys. A 70’s set dark comedy with inklings of a pulp like detective tale that involves everything from pornographic actresses, blue faced goons, talking bees and Ryan Gosling on a toilet, The Nice Guys weaves a quite complicated tale of mysteries, murders and questionable investigating work into a film that at its core often fly’s and sometimes fails off the back of Shane Black’s witty scripting work, the fantastic use of the 70’s landscape and most importantly, the winning combination of the inventive pairing of Crowe and Gosling. Clearly relishing the opportunity to play each other’s foils, Gosling and Crowe are the best they’ve been in years here and while Gosling has shown his comedic chops in films like The Big Short and Crazy, Stupid, Love, Black un-tap’s a fun side to Crowe we haven’t really seen before even though some could claim ventures like The Good Year and Mystery, Alaska tried to show off a lighter side to the phone throwing adopted Australian. 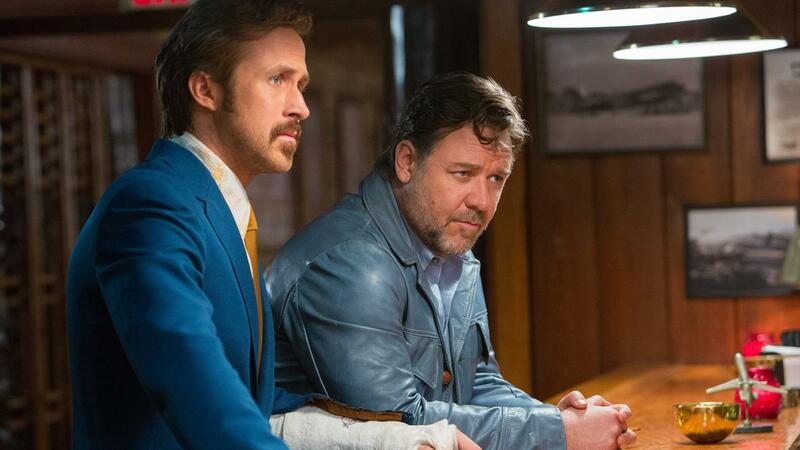 The Nice Guys is Crowe’s best work in sometime and it’s likely his future roles will try to harness his lighter persona that works so well here, even though Gosling steals most of the films best singular moments. Speaking of stealing, young Australian actress Angourie Rice who was first seen in the worth checking out These Final Hours makes a huge impact to The Nice Guys fortunes with a fantastically judged turn as the wise beyond her years daughter of Gosling’s often bumbling Holland March, Holly, and considering it’s no mean feat to outplay two Hollywood heavyweights, Rice could well be “the next big thing”. A sharp, fun and engaging mixture of comedy and mystery with a healthy dosage of violence, The Nice Guys isn’t ground-breaking stuff and some of the potential jokes within the film sadly fall flat but as whole this energetic and colourful vehicle driven by Black’s wit, Gosling and Crowe’s fine pairing and Rice’s star making turn, this is easily one of the year’s easiest to like cinematic diversions. Great review. I can’t wait for a chance to get on it myself. Cheers Hank, I’ll think you’ll have a great time with this one. Absolutely, its been really well received so far. I’m a big fan of Shane Black and this looks like Kiss Kiss Bang Bang, which I loved, can’t wait to see it. Its very much cut from the same cloth buddy. Saw it tonight. Gosling pulls of some cracking slapstick. the whole scene when falls down the hill and finds the body is fantastic. Oh yeh he knocks some of it outta the park Ryan! Good review Eddie. Had a great time with this and was able to look over any flaws there may have been. It was a lot of fun wasnt it man? Even if some of the jokes and plotline feel a little flat. Shes a great young actress. I expect big things from her.